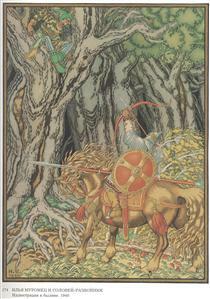 Ivan Yakovlevich Bilibin (Russian: Ива́н Я́ковлевич Били́бин, IPA: [ɪˈvan ˈjakəvlʲɪvʲɪt͡ɕ bʲɪˈlʲibʲɪn]; 16 August [O.S. 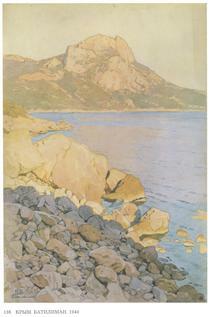 4 August] 1876 – 7 February 1942) was a 20th-century illustrator and stage designer who took part in the Mir iskusstva, contributed to the Ballets Russes, co-founded the Union of Russian Painters (Russian: Сою́з ру́сских худо́жников) and from 1937 was a member of the Artists' Union of the USSR. 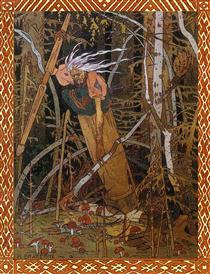 Throughout his career, he was inspired by Slavic folklore. 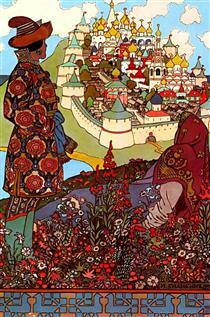 Ivan Bilibin was born in Tarkhovka, a suburb of St. Petersburg. He studied in 1898 at Anton Ažbe Art School in Munich, where he was heavily influenced by Art Nouveau and the German satirical journal Simplicissmus, and then under Ilya Repin in St. Petersburg. 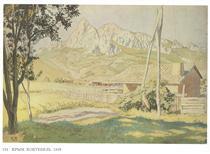 After graduating in May 1901 he went to Munich, where he completed his training with the painter Anton Ažbe. 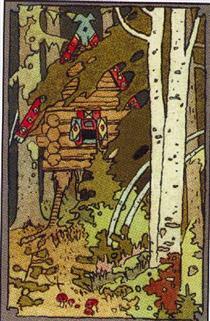 In 1902–1904 Bilibin travelled in the Russian North, where he became fascinated with old wooden architecture and Russian folklore. In the period 1902 to 1904, he also went to the ethnographic section of the museum of Alexander III to collect Ethnographic material and to photograph monuments of old village architecture in the Vologda, Olonetsk and Arkhangelsk and Petrozavodsk. 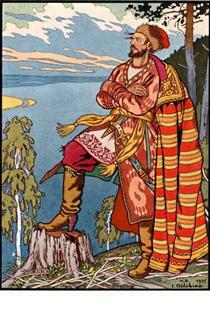 He published his findings in the monograph Folk Arts of the Russian North in 1904. 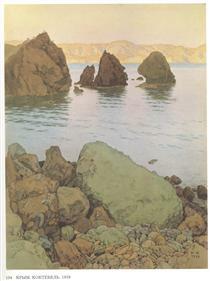 Another influence on his art was traditional Japanese prints. After the formation of the artists' association Mir Iskusstva, where he was an active member, his entry into the newspaper and book graphics scene began with a commission for the design of magazine Mir Iskusstva in 1899, later contributing essays on Russian Folk art. 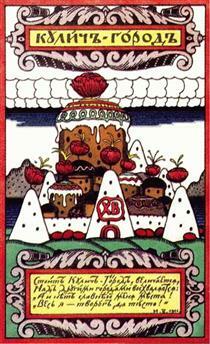 Artistic design of other magazines such as Dog Rose (Шиповник) and expenditure of the Moscow publishing house followed. 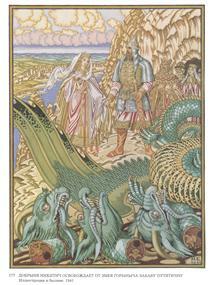 Bilibin gained renown in 1899, when he released his illustrations of Russian fairy tales. 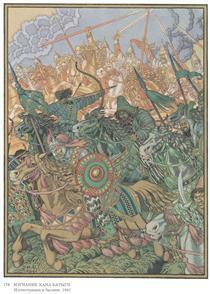 During the Russian Revolution of 1905, he drew revolutionary cartoons, especially for the magazine "Župel" (Жупелъ), which in 1906 became prohibited. 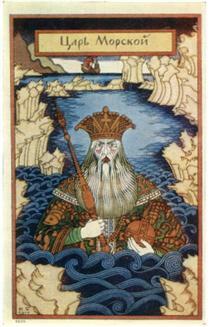 He would further serve as the designer for the 1909 première production of Nikolai Rimsky-Korsakov's The Golden Cockerel. 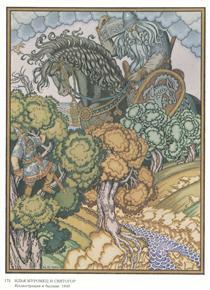 In 1911, Bilibin was hired by the State Paper Manufacturing Section to ball programs, exhibition and book posters, postcards for the Red Cross's Society of St Eugenia and envelopes and stationary with the Russian Bogatyrs. 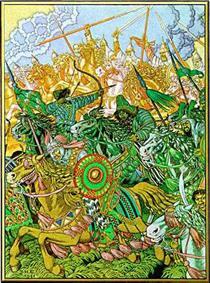 After the October Revolution in 1917, Bilibin left Russia when the revolution proved alien to him. 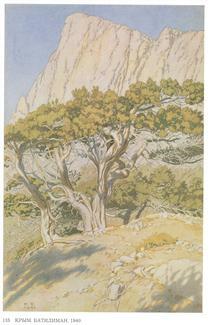 He moved to Cairo and Alexandria where he painted for the Greek colony, then settled in Paris in 1925, where he took to decorating private mansions and Orthodox churches. He still longed for his homeland and, after decorating the Soviet Embassy in 1936, he returned to Soviet Russia, delivering lectures at the Russian Academy of Arts until 1941. 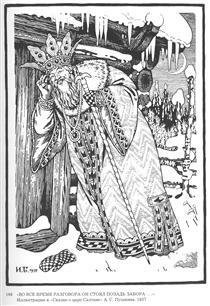 Bilibin died during the Siege of Leningrad, starving within the city when he refused to leave, and was buried in a collective grave. 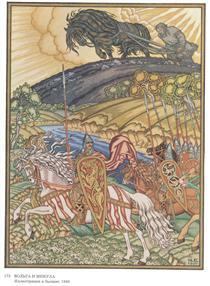 In 1902 Bilibin married his former student, the Irish-Russian painter and illustraotr of children's stories Mary Chambers (Мария Яковлевна Чемберс). They had two sons; Alexander (1903) and Ivan (1908). In 1912 he again married a former student, the art school graduate Renée O'Connell (Рене Рудольфовна О'Коннель), granddaughter of Daniel O'Connell. 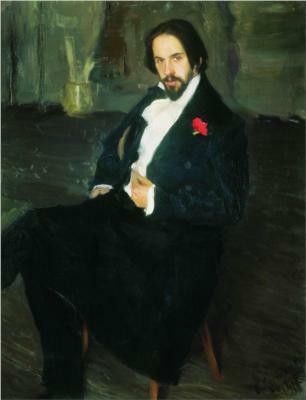 In 1923 he married the painter Alexandra Shchyekatikhina-Pototskaya (Александра Васильевна Щекатихина-Потоцкая), with whom he had a joint exhibition in Amsterdam in 1929. 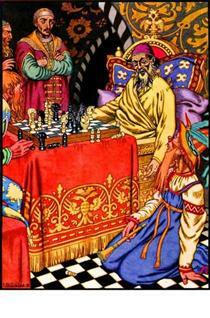 Illustration for The Tale of Igor's Campaign Ivan Bilibin ? Judgement. 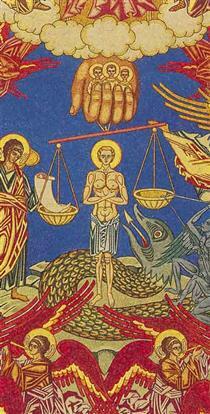 Sketch of murals for of the church of the Assumption in Olshany Ivan Bilibin ?